As your garden begins to burst into bloom and colour over the summer months, you may wish your home could capture some of the vibrancy of your garden. The best way to inject some colour to the appearance of your home is to add window boxes. A window box will brighten up a drab wall and is a great way of drawing the eye from ground level, linking your home with the surrounding garden. Creating a planted environment above ground level is particularly useful if you have limited space. For those with no access to a garden, window box planters are a way of growing a selection of plants, flowers or herbs and bringing some colour to urban surroundings. In more conventional gardens, they help lift the eye above other planting and can soften architectural features. Many plants do well in window boxes, but for an ever-changing display, choose a range of plants that will last all year round with some annual flowers which you can replace as they lose lustre. Plants with a trailing habit are ideal and effective displays can be created by a mass of flower and foliage. 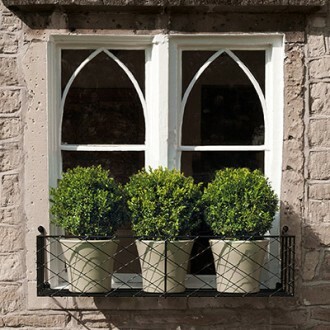 Our wrought iron window boxes have a pared down design which will suit any style of property, from a country cottage to the more urban environment of a city apartment. They provide robust support and can even be fixed directly to a wall – no window necessary. With an inexhaustible range of plants that do well in containers, bring some colour and fragrance to your home this summer with a window box.